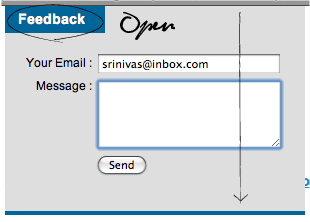 This post about feedback mail with nice slide effect using php SMTP class and jQuery. It's very useful to add your php websites as like contact/feedback page. I have downloaded this SMTP class from phpclasses.org. Include with jQuery Slide effect just you have to upload these files into hosting server. Feedback page with slide effect. Contains simple PHP and HTML script. You have to change feedback email id. Upload this file into your hosting space. No need to touch this code it's automatically detects your website SMTP mail address. Include this CSS code in feedback.php. Note : I was hosting my demos is 110mb.com. Its a free php hosting area they are not providing any SMTP support. if this was using AJAX to send the email without reloading the page - it would be perfect! Warning, the feedback page with slide effect doesn't wokr well in ie6. Hello! your work is great but i am getting error on this script. please help me to solve this. SMTP feedback mail class not working,, it's shows error msg "Error in sending mail! Thankyou for this tutorial..i need a help can we send different email attached with a link based upon the selection done from a dropdown field ? ?